Thank you to all who signed up for the Sugar Soul Studio mailing list, at last weekend's very successful Make It Show and Sale, for a chance to win a free hat. After spending most of the week in Banff (without my sewing machine! ), I have finally made the draw. The lucky winner is...Ashley Young!! Congratulations! Other news...there are only 2 more weeks left for the Downtown City Market. 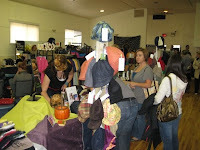 Next Saturday, October 4th, will be my LAST Saturday at the market although you will find some of my hats for sale with Julie, of Majesty (www.majestyinc.ca), on the final Saturday, October 11th. I will be in Calgary at the Inspired Show and Sale October 10th and 11th. Also, Zaytoon, a great new store in Millet, has its Grand Opening October 3rd (11-7) and 4th (11-6). Owner, Zeina Haddad, is committed to supporting local artisans and crafts people and has collected some fantastic merchandise (including Sugar Soul hats, of course!). Can't wait for the opening, Zeina!! Enjoy this beautiful start to October and hope to see you next Saturday!